What are the lessons to be learned from the Obama campaigns use of social networking software to mobilise supporters and raise $650 million? THE SUCCESS OF BARACK OBAMA has been attracting world attention because he will be the first African-American, indeed the first non-white President of the United States of America. Some attribute his success to his opposition to the war in Iraq; others to the dreadful meltdown of US financial institutions that galvanised the American electorate in September. And many people to whom I have spoken since 4th November, and many public commentators besides, paradoxically regard Obama as a doomed man for those very reasons. It may be that his hands have been tied, his chalice poisoned. He will inherit two problematic and unpopular wars, a ten trillion dollar national debt, a growing energy crisis, an economy sliding into recession and, of course, his own commitments to cut taxes. 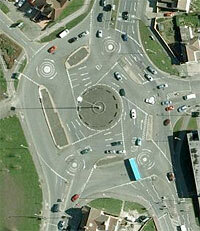 Many who voted for the largely unspecified change promised by Obama may come to be disappointed. If he is forced to govern in financially conservative ways, which seems likely, the honeymoon may be a short one. Relations with the rest of the world may be just as fraught with dilemmas. If he cant cut taxes and he cant cut spending, he will have to resort to the third instrument: the printing press. Paying off your foreign creditors by printing dollars, provoking inflation and a drop in the value of the dollar so that those creditors lose half the value in real terms of what they loaned to you, is not a good way to make friends abroad. A cheaper dollar also hurts those countries which rely on the American market. Probably the most amazing feature of the Barack Obama campaign is the way he was able to come from a starting position right outside of the Establishment, yet build a huge political machine, and raise a phenomenal war chest: an estimated total of $650 million, according to Richard Lister of BBC News. Which was a necessity, because Obama had to fight not one expensive campaign, but two. The Clinton camp in the Democratic Party machine had a virtual monopoly of all of the partys big-money donors and fundraisers, and during 2007 had amassed about $100 million. According to a fascinating article by Joshua Green in The Atlantic magazine dated June 2008, Obamas initial financial support came from a hitherto untapped source: hi-tech Northern Californian Democrats who were software entrepreneurs and venture capitalists, adept at networking, and at ease with the Internet technologies that support it. Mark Gorenberg, a partner in a San Francisco venture capital firm, got into political fundraising in 2003, to support John Kerrys bid for the Democratic party nomination. He got friends and colleagues to commit not just to making a personal donation, but more importantly to commit to raising a certain amount from others. In the same year, Howard Deans supporters pioneered the use of the Internet to raise large numbers of small donations, such that before long he had out-fundraised both Kerry and Edwards. Deans team also pioneered the use of social networking sites for political organising, making use of sites like MeetUP.com to bring local activists together. A few days before Obama declared his candidacy, there was a fund-raising dinner held for him in Northern California, hosted by John Roos and attended by Mark Gorenberg and Steve Spinner. It seems that the Clintons had overlooked the potential for Democrat financial support from the rich young Silicon Valley entrepreneurs, who in any case were readier to click with Obama. Gorenberg joined Obamas national finance committee and was delighted to find that the campaign was ready to embrace new ideas about how to build networks and communities with online tools. Spinner also joined, and took the initiative to found an online affinity group, Entrepreneurs for Obama. Obama spoke to the network by videoconference, and soon it was raising big bucks. But central to the success of the Obama campaign has been the site My.BarackObama.com, created along social networking lines. Indeed, Facebook co-founder Chris Hughes took a sabbatical from his company and came to Chicago to work on the campaign full time. Joe Rospars, a veteran of the Dean campaign who had in the meantime set up an Internet fundraising company, joined as head of new media for the Obama campaign. Weve tried to bring two principles to this campaign. One is lowering the barriers to entry and making it as easy as possible for folks who come to our Web site. The other is raising the expectation of what it means to be a supporter. Its not enough to have a bumper sticker. We want you to give five dollars, make some calls, host an event. People who signed up at My.BarackObama.com could register to vote through the site, and could set up their own personal affinity group with a listserv, to lobby their friends and associates. They could hit a Make Calls button and get lists of phone numbers to call. They could set up their own personal fundraiser page, set a target with a thermometer to display progress, and set to work raising money for the campaign. It was the Howard Dean approach, but with new tools and a tech-savvy team; the site attracted more than three million donors and fundraisers. Accumulating huge amounts of money, much of it in ten- and twenty-dollar amounts, has been proved capable of outweighing the old model of political fundraising. The first sign of this came after Super Tuesday, when the Clinton campaign ran out of money. Meanwhile Obamas campaign was rolling in cash. He went on spending on advertising, winning the next 11 primary contests. When it came to the presidential election, McCain was hampered by having chosen to accept federal campaign funding: as a condition, he had a cap imposed on his spending. Traditionally, there are Democrat states and Republican states and relatively few swing states, and the parties focus their attention on campaigning in the swing states and to a lesser extent in their safe states, ignoring the rest. But the Obama-Biden campaign had the money to put paid campaign workers into every one of the 50 states. They bought television advertising nationwide, too  culminating in the 30-minute advert that aired at eight in the evening on 29 October on NCS, CBS, Fox, Univision, MSNBC, BET and TV One, gaining an estimated 30.1 million viewers. This, then, is to my mind the most interesting part of the Obama campaign: Politics meets Web 2.0, achieving unprecedented engagement and partipation, unprecedented fundraising, and an unprecedented nationwide media campaign, substantially extending the Democrats demographic, and advancing victory into states such as Virginia that had not voted Democrat for 40 years. I started this post by noting what a sticky situation Obama is going to be in when he enters the White House in January. Is there anything he can do that will be different, unexpected? Might he make use of the 3-million-strong network of contacts and supporters that was built to get him to victory, or is it destined to fall away and burn up like an exhausted first-stage booster rocket, no longer needed? You made history every single day during this campaign  every day you knocked on doors, made a donation, or talked to your family, friends, and neighbors about why you believe its time for change. So  what comes next? The New York Observer, 26 June 2008. IN MY LAST BLOG ENTRY I described being at the BarCamp5 Spillover event held at the BCS London meeting rooms. On 9th October it will be my turn (with colleagues) to run an event in the same location: the MetaKnowledge Mash-up 2.0 gathering [But see NOTE below], organised by KIDMM and ISKO-UK and with the focus Making and Organising Knowledge in Communities. 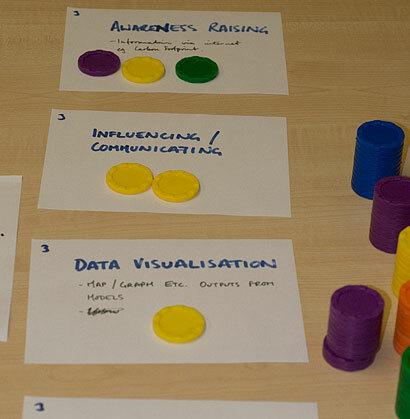 Plastic poker chips being used to rate the importance of topics generated on cards by group members, in a discussion about computers and climate change. The instructions for BarCamp said Come with something you want to talk about, and I brought along with me a concern about the best way to conduct small group exercises on the afternoon of the 9th. People there will be seated in groups of up to eight around tables, an arrangement which affords a surface for a card-sorting exercise. In the BarCamp discussion which I led, I explained how cardsorting works and how it can be used to understand how people group things, be they ideas, features of a product, whatever. In information architecture and product design enterprises, letting a representative group of users sort cards can help clarify what people expect of or hope from a product or service. Theres a variant called divide the dollar which I read about through Uzantos Mindcanvas site, which offers these Game-like Elicitation Methods (GEMs) on-line. In this, each participant is given a number of coins or chips and asked to distribute them across a set of topic cards to indicate in quite a subtle way the degree of value attached by that person to each. What has this to do with a KIDMM/ISKO conference? Well, in considering making and organising knowledge in communities we will be hearing case-studies from a number of organisations who are using electronic tools to enable long-term and long-distance discussion and collaboration within their communities, with the aim of accumulating and organising knowledge. Tools like email lists, bulletin boards, blogs, wikis, social networking sites, and online media repositories for documents, audio files or video  in addition of course to face to face gatherings and designed-for-print publications. Which of these approaches seem to hold out most advantages, and how might they be combined? The workshop session is when we can deliberate on this, and a cardsort is my proposed mechanism for this. Hopefully, all participants will appreciate the opportunity this exercise will afford to sift through the approaches weve heard of through the day, and brainstorm a few more. And for the KIDMM community, this foray into requirements elicitation has another benefit  with the assistance of a final-year software engineering student, Susan Payne of De Montfort University, we are embarking on our own venture into online community. In the next eight months, Susan will be writing a custom web application based on a CMS (content management system), designed to match the needs of knowledge communities such as KIDMM. 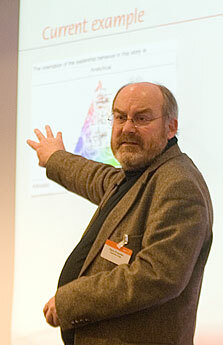 MAKING AND ORGANISING KNOWLEDGE IN COMMUNITIES is the title of the conference which will be held in London on 9th October 2008; a joint endeavour of KIDMM (Knowledge, Information, Data and Metadata Management) and ISKO-UK (the UK chapter of the International Society for Knowledge Organization). The conference Web site is here. KIDMM is a project with which I am very closely associated. It is probably best described as a discussion community, which primarily manifests as an email discussion list hosted on the JISCmail UK academic system, and this currently has 76 members. KIDMM arose initially from the recognition of a group of people, all active in different Specialist Groups of the British Computer Society, that knowledge, data and information  a whole lot of stuff which masses of computing power are now devoted to creating, storing and serving up access to  together formed a topic of interest across our Specialist Group boundaries. The organisation of KIDMM has remained informal, and membership of the community has now extended outside the BCS. The way things have evolved, theres also a significant overlap of membership with ISKO-UK. KIDMM ran a conference last year, the MetaKnowledge Mash-up, which was a great success. This years conference is in the same mould, but as the title suggests, has a focus on how knowledge can be elicited from members of a community of practice or community of interest, gatherd, organised, and turned into something useful. This is a hot topic in knowledge management, in industry and the public sector, and for professional and learned societies like the BCS. We consider knowledge and learning… with some trepidation. On the one hand, epistemology, the theory of knowledge, has formed the centerpiece of heavyweight philosophical arguments for millenia. On the other, knowledge management has many aspects of another lightweight fad. That enemy of lightweights, The Economist, has pronounced it no more than a buzzword. We may, then, be trying to lift a gun too heavy to handle to aim at a target too insubstantial to matter. This is an issue that Ive spent quite some time thinking and reading about over the summer, since the decision to go ahead with this conference topic. So, one of my two substantive contributions to the event has been to write a literature and concept review which I hope will deploy some of the concepts we can usefully use in our discussions on the day. You are most welcome to download it (PDF). As for my other contribution, that trial still stands before me. Its relatively easy to organise a conference as an array of speakers (and I mean no disrespect to our speakers, we have a good line-up!) But we are keen to spend at least an hour in a set of parallel round-table discussion workshops, sharing ideas about how to maximise participation and knowledge sharing, using the new techniques that the Internet affords in addition to traditional tools such as meetings and publications. With less than two weeks to go, I must now turn my mind to how best to organise that session! SINCE I READ an interview with Rashmi Sinha in the Information Design Journal, Ive followed her enterprises with great interest. Most recently shes been involved with setting up and running SlideShare.net, a place where you can upload your presentation slides  be they PowerPoint, OpenOffice or PDF  and share them either privately with an invited group or with the world. Now, ordinarily that facility wouldnt appeal to me. You see, when I prepare slides to accompany a talk, I dont put much text on them. I believe that weve only got one language-processing centre in our brain and it has to cope with making sense of words whether they come in through the eye or the ear. So, making people read and listen to you at the same time is not a smart thing to do. A lot of the time, my slides just have pictures on them. But I did get interested when I heard about slidecasting. Thats SlideShares term for linking an audio file to your slides and synchronising the turning of the slides to specific points in the audio file. Its hardly a new idea, in fact it is reminiscent of the old slide-tape shows, but it could be an excellent way to broadcast ideas over the Internet, and I thought I should give it a go. The opportunity arose. On 17th September I am due to speak at an event on climate change organised by the British Computer Societys Sussex Branch. I have to fit into a tight time-slot and though I usually speak from a handful of notes, this time I thought I should script my talk and time it. 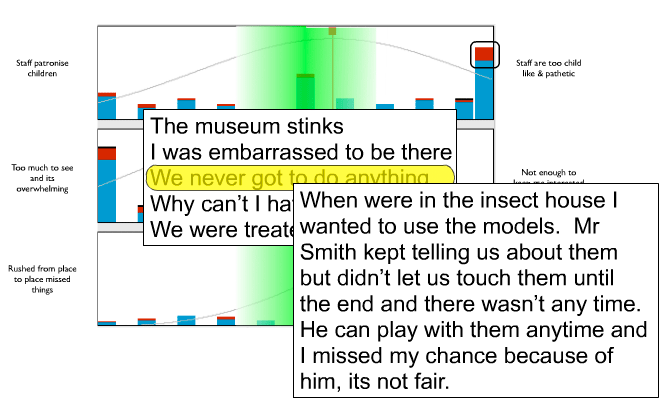 So here I had the perfect test case for slidecasting! I dont do PowerPoint, so I made my slides in Adobe InDesign CS3 by creating a document the pages of which measure 1024 points wide and 768 points high. Images were prepared in Illustrator and Photoshop. Finally, I exported the 42 pages as a PDF file, and this is what I uploaded to my SlideShare account. Audio is more of a challenge, but I quite frequently record conferences for the BCS and other organisations, and I also record voiceover narrative for video productions. 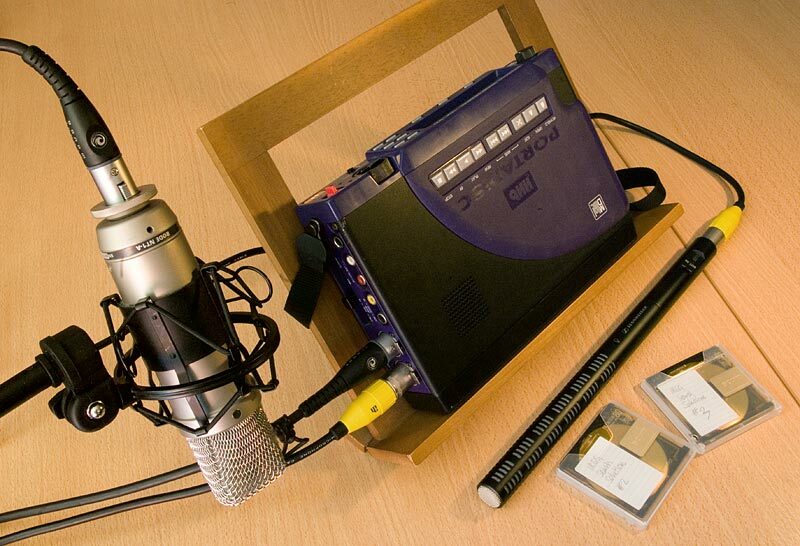 My preferred kit for this purpose is an HHB professional MiniDisc recorder and a Røde condenser studio microphone. However, at the moment the HHB is sick, so that was out of the question. My back-up recorder is very small indeed. Its an Olympus DS-50. It has three sensitivity settings marked Dict, Conf and Lecture. The stereo microphone that plugs into it is actually quite good quality, considering. 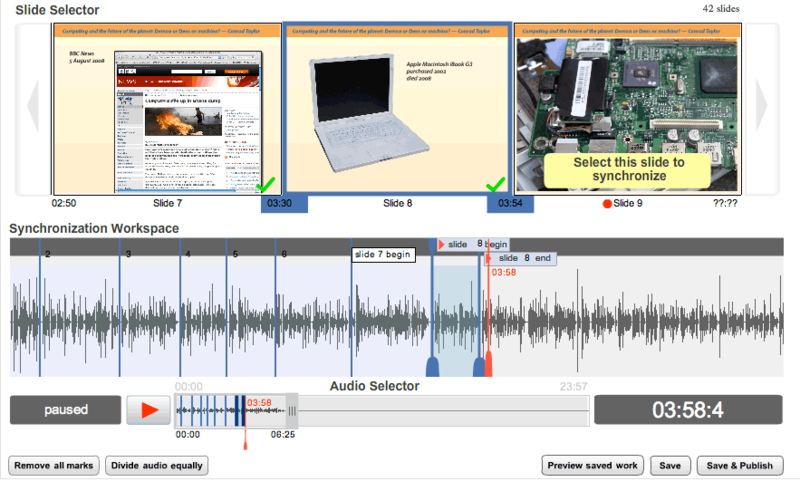 The audio is saved into the solid-state memory as Windows Media Audio (WMA) files, and there are five compressions one can choose from, and I always go for the most gentle. So I took my script and chose the bedroom as the quieter place to record: it doesnt face onto the river with all its traffic. 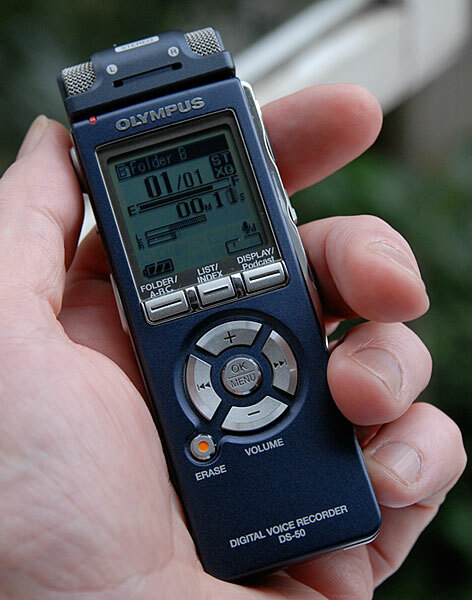 I set the Olympus on Dictation-mode sensitivity to suppress as much background noise as possible and arranged a place for it quite close to my mouth, and made my recording. The thing to do is, if you fluff your lines or a magpie decides to add an accompaniment, you just repeat that paragraph and deal with it in the editing. The Olympus attaches to the Macintosh as if it were an external USB drive and you copy the recording file across. Macs dont much like WMA files but Id bought Patrice Bensoussans EasyWMA audio converter plug-in for QuickTime ($10) and converted the file to AIFF for editing. I use Apples Soundtrack Pro for editing, chopping out the out-takes and suppressing intakes of breath. I thought the output from the Olympus sounded a bit tinny; the solution was to use the Fat EQ filter to boost the lower frequencies until it sounded like me again. I saved the result as mono AIFF and then took it into iTunes to convert it to MP3. My standard podcast settings use a data rate maximum of 56 kbps, 16 bits of precision, Variable Bit Rate and best quality conversion. The 23 minutes of speech came out slightly less than 10 MB. SlideShare.net are quite generous in the size of presentations you can upload  up to 100 MB  but for now at least they wont host your audio. You have to find somewhere from which audio will stream, and they recommend placing it on The Internet Archive, which is what I did (I already had an account there  its free to use, as is SlideShare.) Once you have copied the URL where your sound file sits, you paste that into a field on SlideShare, and the slides and audio are connected. SlideShares synchronisation tool: click image to enlarge! I had feared that the synchronising of the slide-turns to the appropriate places in the talk would be tricky, and it was the most difficult part, but I soon got the hang of it. Considering that you are working with files on two different servers on the other side of the world, its quite amazing that it works at all! If you click on the thumbnail image of the screen shot, youll see my edit in progress. The slides slide along in the upper channel, and the synchronisation workspace shows the waveform of the audio, which is something I feel very comfortable working with. The Audio Selector at the bottom wasnt immediately intuitive to me; you slide it along to reveal another bit of the audio further on. The red line in the Workspace is the playhead and you play and pause the audio to find the sync points. I kept trying to stop and start the audio by hitting the space-bar because thats what you do in iTunes, QuickTime and Soundtrack Pro, but not here! The process is a bit clumsy, and due to the latency across the Internet its a bit unresponsive at times. As you move the slide x end line to where you want it, the next slide asks you to Select this slide to synchronise and when you click on it, it dumps a new blue line close to the previous one. They you play along until you find the next sync spot, drag the rightmost blue line to that spot, and repeat. Its good. It works. Its quite impressive. Its all done with Flash technology. And its here (my first slidecast, I mean). It works full screen too, so you can really see detail if you want. My main gripe is that as my slidecast makes progress, the slides arrive later and later after the points that I had designated for synchronisation. I hypothesise that this may be because my slides have a great deal of graphic content?